Infrared light (experienced as heat) is naturally occurring from the sun, it is the invisible part of the sun’s spectrum with the ability to penetrate human tissue to produce a host of health benefits. Infrared sauna therapy heats the body directly rather than simply warming the air, it raises the core body temperature and produces a deep, detoxifying sweat at the cellular level, where most toxins reside. Infrared also aids in blood pressure reduction & weight loss, burning up to 600 calories in one 40 minute session! 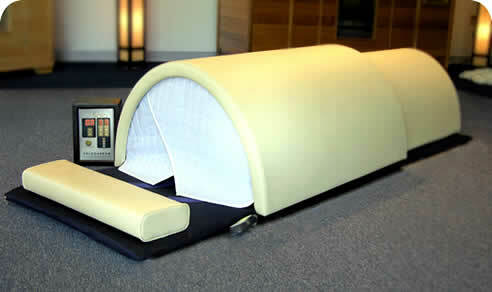 How does the Dome Infrared Sauna work? The heating panels are expressly designed to produce infrared radiated heat or energy that operates in a specific wavelength spectrum that is most acceptable to sauna applications. Each heating panel utilizes copper strips of a specific length and thickness that are embedded in a formulated carbon material that is baked onto a flexible fiberglass shell. The carbon material is infrared emitting. When electricity is applied to the panels, resistance between the positive and negative copper strips produces an even flow of infrared radiated heat or energy. A ceramic powder embedded cloth is bonded to the panel surface. By design, the panels radiate heat and yet they will NOT BURN when touched. Infrared heat or energy produces a radiated heat that moves as energy waves. This process, radiated heat, allows the heat generated in the panels of the dome to be absorbed by a body or object that lies within it. The textbook of Medical Physiology, tenth edition, by Guyton & Hall, states: normal, unacclimatized person can seldom produce more than about 1 liter of sweat per hour. When this person is exposed to hot weather for 1 to 6 weeks, he or she begins to sweat more profusely, often increasing maximum sweat production to as much as 2 to 3 liter per hour”. This is one of the reasons that one should acclimatize themselves when using a sauna and start off using a low heat setting for a short duration or time exposure. The question is then asked, what happens when a person uses a sauna and perspires or sweats at the rate of 1 liter per hour? Perspiring or sweating 1 liter of sweat in 1 hour would calculate to a Calories burned per hour heat loss rate of 580. Stimulation of the cardiovascular system takes place when a sauna is used. The average pulse rate of 75 beats per minute may increase to between 100/150 beats per minute during a 20-minute sauna session. The amount of increase is dependent on the temperature the sauna has been set at. As the pulse beat increases blood circulation increases but blood pressure does not necessarily increase, in fact blood pressure may even go down, especially in a healthy person. The reason for this is that the far infrared energy or heat has caused the tiny blood vessels in the skin to expand, thus accommodating the increased blood flow.